With sight dominating our senses, it is no surprise that colors have come to hold so much meaning and importance in our culture. Consciously and unconsciously, we use color to signify our feelings: a red rose for our love, a yellow one for a good friend. With colors so closely tied to emotion, and emotion so effectively increasing memory retention, it follows that colors are instrumental to powerful and memorable communication. When selecting a main color for a presentation template, take into account the emotions that the content or brand should produce. Is the material meant to excite the audience, rile them up for a new product? Use a bright warm color (red, orange, yellow) to capture the energy of your message. If the material is about a trustworthy medical or financial service, use blues to convey reliability and fortitude. For more ideas on the right colors for your content, check out this awesome infographic from The Logo Company on how brand colors speak to our emotions. Whether the starting point is a predetermined brand color or a color selected for its emotional qualities the next step to building a palette involves color theory. Color theory starts at the color wheel, where our main hues are laid out showing the relationships between primary (red, yellow, blue), secondary ( orange, green, purple), and tertiary (red-orange, yellow- orange, etc) colors. 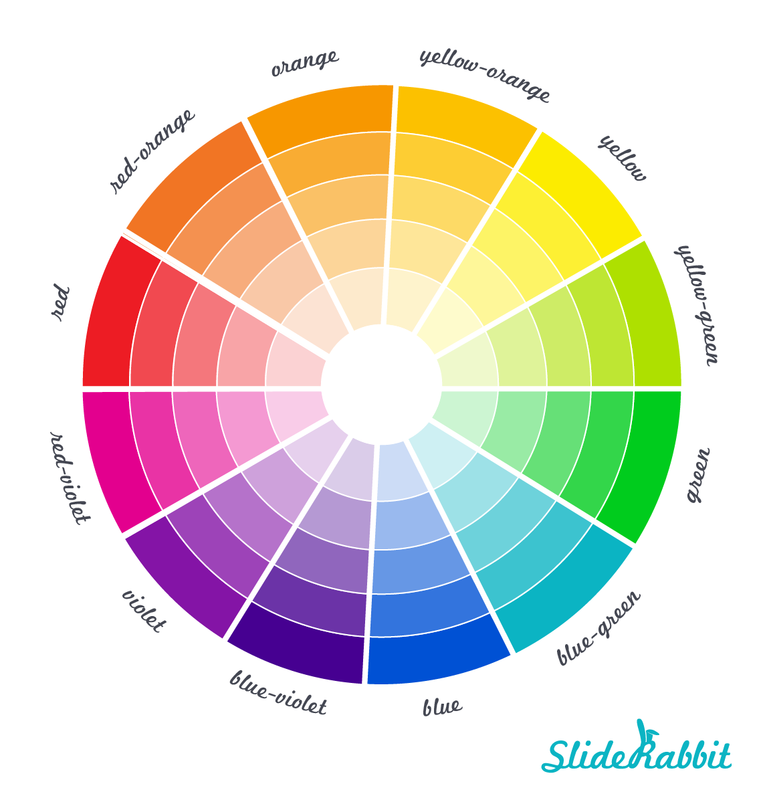 The outer ring of the wheel is the fully saturated intensity of the color. As we move toward the center, the colors become less saturated. There are several different methods used to combine colors from the color wheel to produce a pleasing look & feel. These methods for mixing and balancing colors are called harmonies. Different color combination methods, or harmonies, produce a different feel. Here’s a look at some common harmonies, how they are constructed and how they can be used. Complementary & Split Complementary color palettes are vibrant and striking. 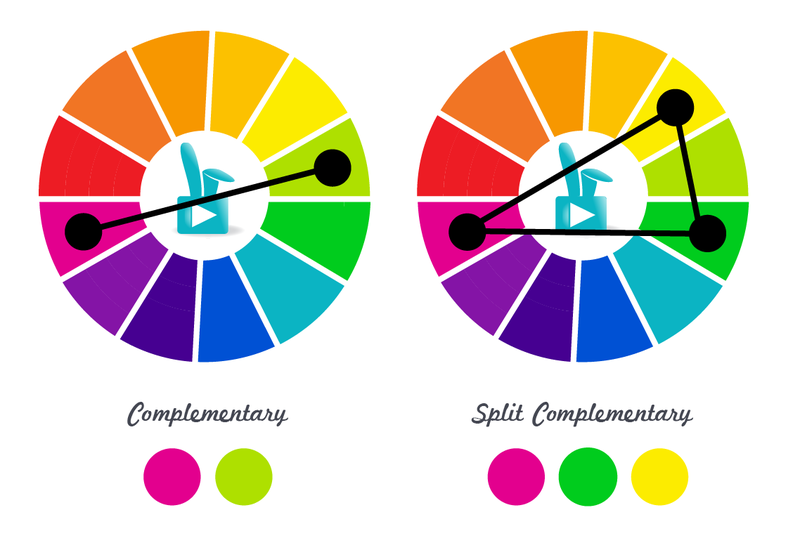 Complementary colors are across the color wheel from each other and provide high contrast. Split complimentary colors are those on either side of the hue directly across from your main color. Analogous color palettes are pleasing to the eye and feel comfortable because they often occur in the natural world, like a sunset of pinks, reds and oranges. Analogous colors are next to each other on the color wheel. 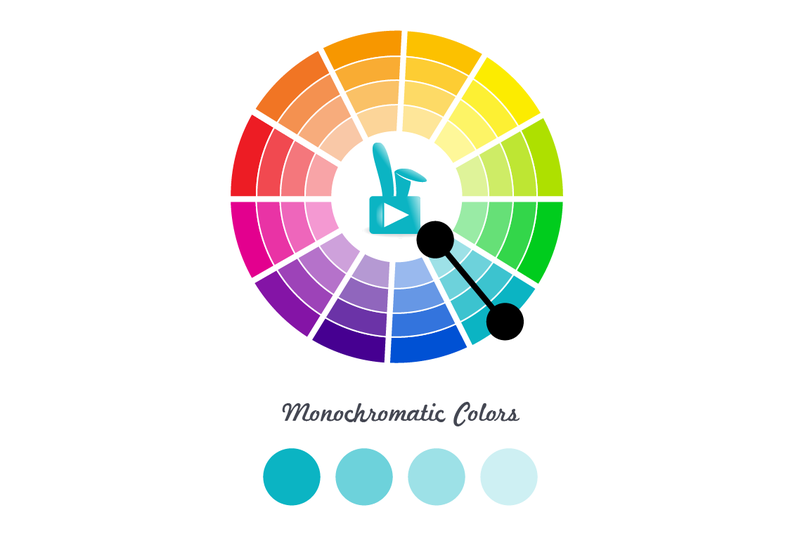 Monochromatic color palettes are built by selecting different saturations of the same color. They feel simple and elegant, but lack contrast. 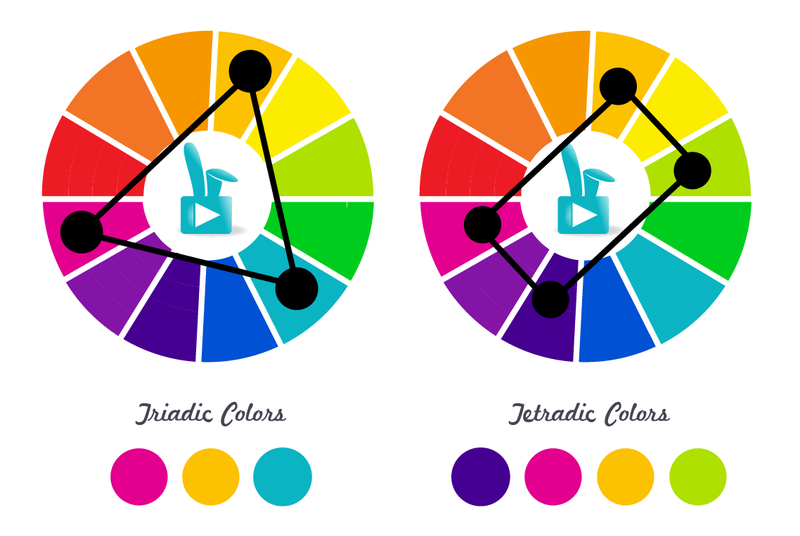 Triadic, Tetradic & Square color palettes use simple geometric shapes (triangle, rectangle & square,respectively) superimposed over the color wheel to determine color harmony. These palettes offer rich contrast and balance. So now that the palette is selected, how do we use it? Once you have your main colors selected, create a palette by adjusting saturation in your two main colors and adding in a neutral. This supplies some variance in the intensity of your colors, but you don’t want to go overboard. Using too many colors can dilute the cohesion of your palette. A limit of 5 or 6 is generally plenty. Take the split complementary harmony, which is both pleasing to look at and easy to work with. This palette has three main colors. To create an intentional and polished look, one color should be dominant. The other two will be used as secondary and tertiary accent colors. To flush out this palette we can add variances of our main hues and a neutral for balance. Adding more hues of your main colors doesn’t change the harmony that you’re using, but you will want to make sure you’re establishing balance. Color balance in the composition will create a more polished and professional-looking piece. 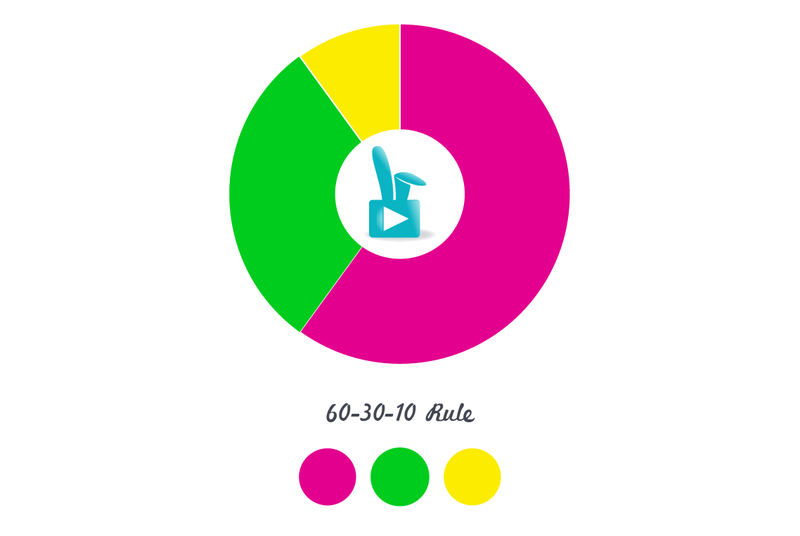 One easy rule of thumb for balancing your colors is the 60-30-10 Rule. 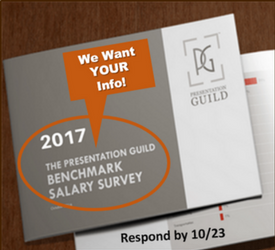 Using this compositional guideline, sixty percent of the color on a given slide will be the dominant color. Use it for big shapes or recurring elements. The secondary color should make up about thirty percent of the color, while the tertiary color is used only for small accents and “pops” to grab attention. Of course, not all content or brand guidelines will fit nicely into the 60-30-10 rule, so don’t be afraid to use your judgment. The best and worst thing about working with color is that there are very few hard & fast rules. The main tenets are: not too many , not too few and do it if it looks good to you. Whether designing for website, marketing collateral or presentation, a good color palette begins to tell the story immediately and subliminally. Evoking emotion through color increases the effectiveness and memorability of the content. 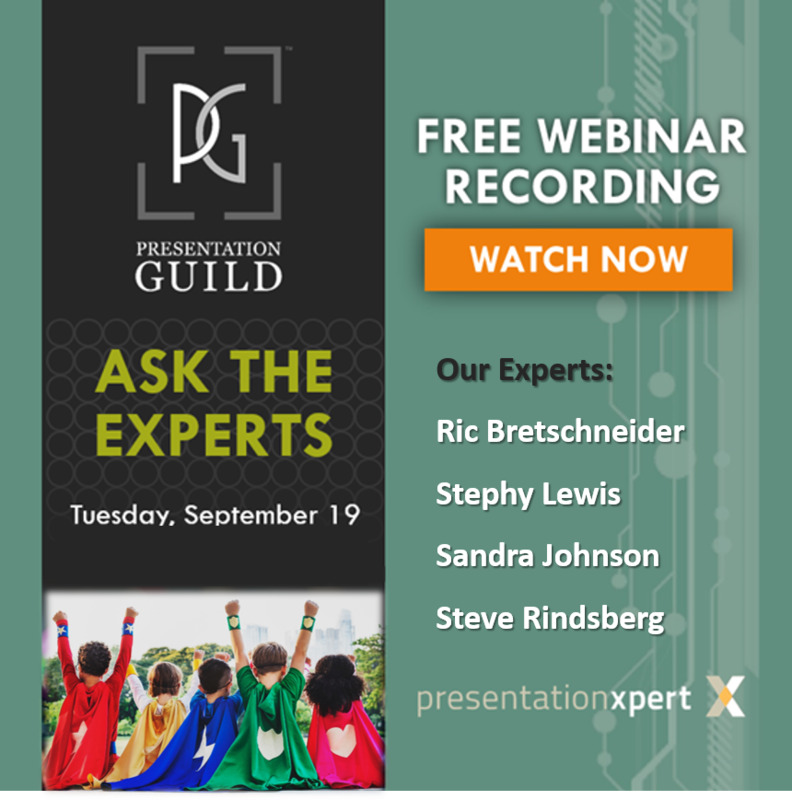 Selecting the right color palette for the message and the content is vital to communicating to the audience on both an intellectual and emotional level. Working with a color palette is a subjective matter, but starting from a solid palette and keeping balance in mind will set you off on the right track. To read more about design theory in general and presentation design in particular, visit our blog, Visual Sugar. Bethany Auck is the founder and creative director of SlideRabbit. 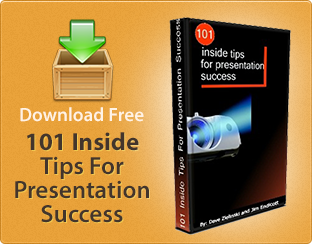 SlideRabbit designs killer custom presentations and infographics.